Rent Brahma Ridge Event Center | Corporate Events | Wedding Locations, Event Spaces and Party Venues. If you’re planning a wedding celebration, Brahma Ridge’s facilities will make your event a success. 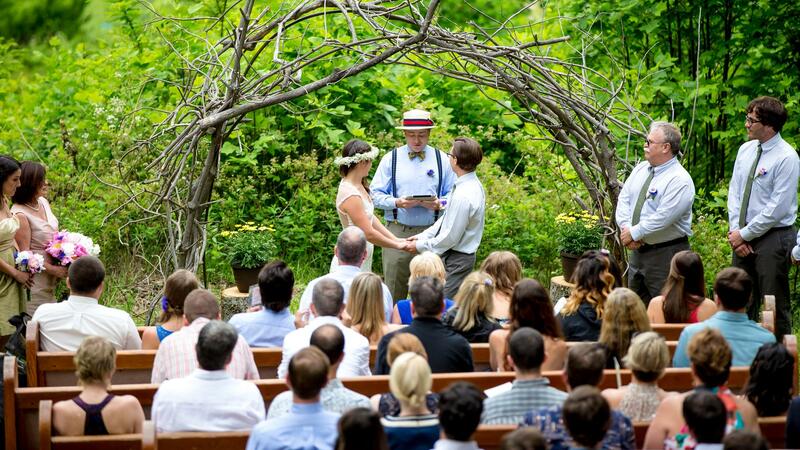 The terrain gently rolls down to a pond with deck and wooden bridge—the perfect backdrop for any ceremony or gathering. Surround yourself with an unspoiled mountain landscape. Rob Denton and Holly Berry (owners) were the first to wed at Brahma Ridge Farm and Event Center May 6, 2006. Holly’s dream of opening an Event Center that would allow her to share with others the blessings of land, love and joyous celebration met with Rob’s dream of organic farming and Brahma Ridge Farm and Event Center was born. Our farm vegetables and flowers. For color we have planted gardens of Wildflower mixes, Black-Eyed Susans, Zinnias, Impatiens, and hundreds of Sunflowers in many places. We also have flowering medicinal herbs – Echinacea, Calendula, and Poppy. Enjoy big mountain views and the natural beauty that embraces this 41-acre sunny, secluded family farm bordering 20,000 acres of Pisgah National Forest. Relax—or kick up your heels—in a country setting generously equipped with modern, elegant amenities. Stay in total comfort in our Earthberm House, or the romantic Catwalk Cottage or nearby Wineberry Lodge. The house, cottage and lodge can sleep up to 30 people per night. Hike our mountain trails and immerse yourself with nature. New glamping tents bring the comforts of home to our camping area. whippoorwills, and the frogs’ summer chorus. For vegetables, we have enjoyed mixed greens year-round out of our greenhouse – including Swiss Chard, Spinach, and Romaine lettuce. In April the Asparagus begins coming in and in May the Broccoli is abundant. We have eat Tomatoes, Cucumbers, Squashes, Green Beans, and pesto made from our Basil. Fresh Salsa with our tomatoes, peppers, onions, and cilantro has been delicious! Some years we have Sweet Corn and Soybeans that bring us some fresh Edamame. Pumpkins and Ornamental Corn will give us decorative displays each Fall. Blueberries and Peaches and also the wild blackberries are usually abundant in summer. We look forward to our young trees of Apple, Pecan, Cherry, and Nectarine to be fruit-producing. Hooray summer!